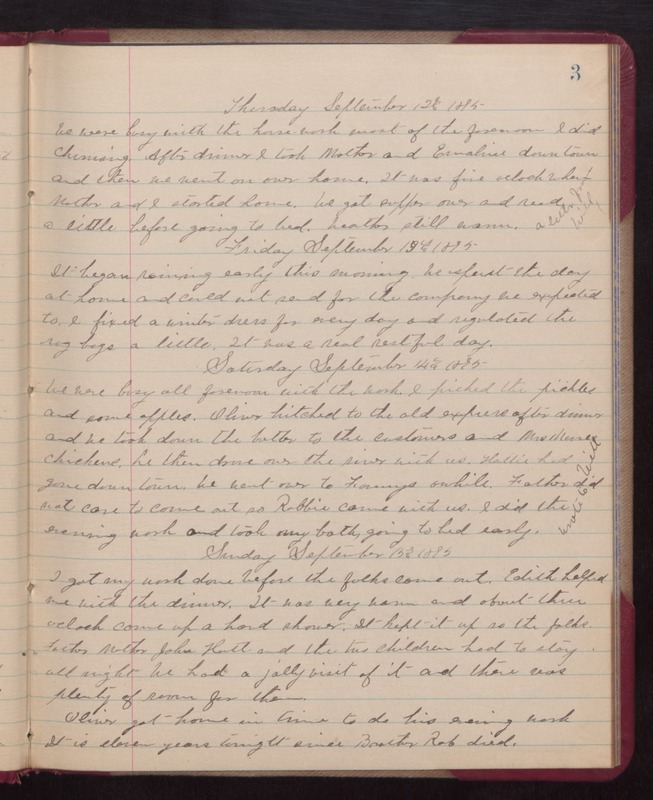 Thursday September 12th 1895 We were busy with the house-work most of the forenoon I did churning. After dinner I took Mother and Emaline down town and then we went on over home. It was five oclock when Mother and I started home. We got supper over and read a little before going to bed. Weather still warm. A letter from Will. Friday September 13th 1895 It began raining early this morning. We spent the day at home and could not send for the company we expected to. I fixed a winter dress for every day and regulated the rag bags a little. It was a real restful day. Saturday September 14th 1895 We were busy all forenoon with the work. I picked the pickles and some apples. Oliver hitched to the old express after dinner and we took down the butter to the customers and Mrs. [Moses?] chickens. he then drove over the river with us. Hattie had gone down town. We went over to Fannys awhile. Father did not care to come out so Robbie came with us. I did the evening work and took my bath, going to bed early. Wrote to Will. Sunday September 15th 1895 I got my work done before the folks came out. Edith helped me with the dinner. It was very warm and about three oclock came up a hard shower. It kept it up so the folks Father Mother John Hatt and the two children had to stay all night. We had a jolly visit of it and there was plenty of room for them. Oliver got home in time to do his evening work. It is eleven years tonight since Brother Rob died.